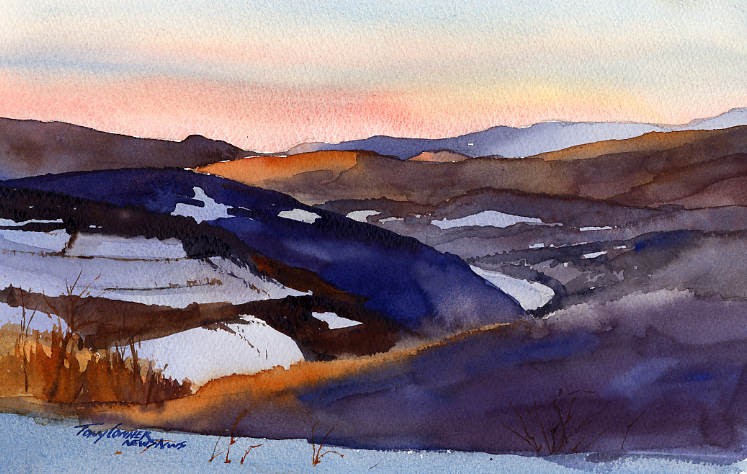 “The Pownal Valley” – painting is approx. 7 1/12″ x 11″, matted and mounted to 11″ x 14″ for easy, low-cost framing. Hoping to get a nice show in the sky, I ended up in this spot near where West Carpenter Hill Road ends – or at least the part that is driveable without a 4-wheeler ends! At this point, the road is high up on and east facing foothill of Mt. Anthony and provides great views east and southeast over the rolling hills in the village of Pownal, Vermont. I was just in time to catch this light show – a great contrast of warm light and cool shade. Yet it was the abstract pattern of snow covered fields against dark areas of forest that really caught my eye. That and the peek of the curve of the valley where the Hoosic River cuts through and around the higher hills. It can be difficult not to get caught up in the details that create a greater sense of realism when painting on location. In this case, I tried hard to keep all the shapes simple and to maintain the balance of color and value that made this a typical morning scene.